A hologram is a 3-dimensional image that can provide a distinctive appearance to specific areas of a digitally printed application. The hologram is developed photographically with the use of laser beams as the imaging light source and special optics that reproduce an illustration or photograph as a 3-dimensional image. The image is transferred to a special foil film. A hot stamping process is used to apply the hologram to the selected substrate. A random (wallpaper) hologram has a spectrum of color changes when viewed from several angles. The image below shows how the hologram appears in a stationary position. The hologram shown on the bottom represents how it appears to the human eye as it is moved. Holograms designed specifically for a client's needs, such as logos or architectural images, can be expensive to produce, however, a wide variety of off-the-shelf stock graphics are available at a fraction of the cost. 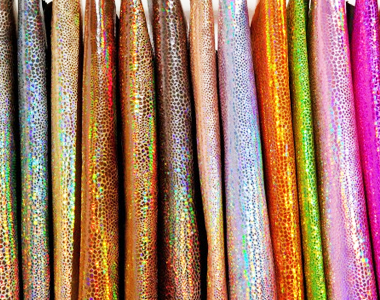 Diffraction foils, which are used as distinctive alternatives to custom holograms, are one of the off-the-shelf products that are available. Diffraction foils reflect multicolored images and patterns; however, they are flat in appearance. Other off-the-shelf foils are also available that provide greater depth and dimensional effects. Holograms are produced either as registered or random (wallpaper) patterns. If the pattern or image is registered, it requires tight alignment controls for the hot stamping process. This is to ensure that the hot stamp die strikes each registered image precisely so that it is fully transferred onto the print material. Random patterns, however, are continuous throughout the foil material with no beginning or ending points. Therefore, when a random pattern is stamped into the stock, there is no need to be concerned for exact registration of the hot stamp die onto the foil pattern. Patterned Images : Patterned images are geometric designs that are uniformly repeated throughout the foil or are randomly placed. Three Dimensional Images: Three dimensional images are realistic 3-D illusions of various inanimate objects. Multiple Plane Images : Multiple plane images are layered and repeated several times to create a 3-dimensional effect. Stereogram Images : Stereogram images are 3-dimensional images of live objects presented in active sequences. The stereogram image is the most expensive hologram to produce. More Information about our services are available in the brochure.